By late September 1917 all hope of the decisive breakthrough for which Haig had optimistically hoped had gone. The final objective to be seized in his Flanders Offensive before the winter set in was the heights of the ridge overlooking Ypres. The highest point of this ridge contained the ruined village of Passchendaele. Haig ordered Plumer and Gough to prepare a plan for the seizure of this ridge, using the now familiar approach of “bite and hold”. Haig proposed to use two armies for this final assault – the Fifth Army in the northern part of the Salient commanded by Gough and the Second Army in the southern part commanded by Plumer. The spearhead of Plumer's attack would be the two Anzac Corps, fighting side by side for the first time – I Anzac was commanded by General W.R. Birdwood, II Anzac by General Sir Alexander Godley. 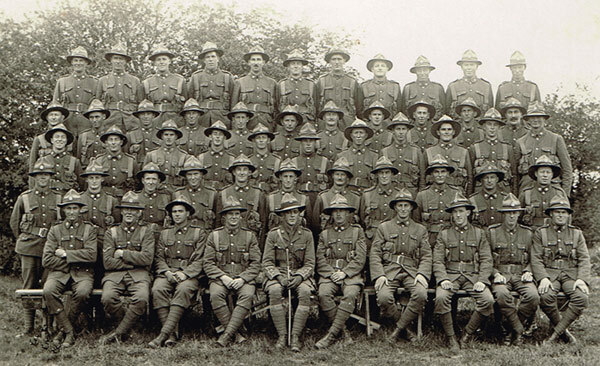 The New Zealand Division was part of Godley's II Anzac Corps. The 23,000-man New Zealand Division marched to the Ypres area on 24 September 1917. It took six days, moving at a rate of 20 miles per day. They moved through the ruined town of Ypres and into the Salient to the area in which they would assemble for the assault. A number of spurs ran down from the Passchendaele Ridge. The New Zealanders were tasked to seize two of these spurs – the lower Gravenstafel Spur and the larger Bellevue Spur. Facing them was a quagmire, as incessant shelling had destroyed the stream beds that drained the ridge. Ruined farms had been replaced by pillboxes supported by tangled scrolls of barbed wire. The initial objective of the attack on Broodseinde, the section of the ridge opposite Ypres, was the seizure of the first low ridge in front of Passchendaele. This first “bite” would then be held, while the second “bite” would be the heights of Passchendaele itself. The initial assaulting forces – 1st Auckland and 1st Wellington battalions from the 1st Brigade and 3rd Otago and 3rd Auckland battalions from the 4th Brigade – were in position by the evening of 2 October and received a thorough briefing from their commanders about their role. This initial assault group would seize the area up to a designated Red Line. They would then be leapfrogged by a second group consisting of 2nd Wellington and 2nd Auckland battalions from the 1st Brigade and 3rd Canterbury and Wellington battalions from the 4th Brigade, who were to capture the area up to the Blue Line. On the evening of 3 October, the weather changed, bringing gale-force winds and rain. The assault troops huddled uncomfortably in their assembly trenches and tried to sleep through this bleak night. At 6.00 a.m. on 4 October, the British artillery barrage opened up across the whole of the front. The infantry “hopped the bags” and moved onto attack, and for the first 200 yards, the advance was easy. Little resistance was experienced as a result of the artillery barrage. As they progressed, however, the New Zealand brigades ran straight into an intense German machine gun barrage. Using the now-familiar “fire and manoeuvre” tactics, sections laid down suppressing fire on pillboxes and strongholds while other men moved forward with grenades to clear the obstacles. Both battalions reached the Red Line on timetable, dug in and waited to be leapfrogged by the succeeding battalions while the artillery barrage continued. The Canterbury battalion advanced over the Abraham Heights, continuing to suffer heavy casualties from the intense machine gun fire from German defences further up the ridge. However, they pressed on and by 11.00 a.m., on schedule, the Blue Line had been reached and secured, and mopping up of all remaining centres of resistance had ceased. German counter-attacks continued throughout the morning and early afternoon, but the troops, having reached the Blue Line, dug in and with the assistance of the continuing artillery and machine gun barrage, resisted all attempts to remove them from this hard-won advance. The Germans made three further attempts at dislodging the New Zealanders from their new front line, but each counter-attack faltered before withering machine gun fire and accurate artillery support. The Division held its position while the stretcher bearers began their exhaustingly grim task of locating and evacuating wounded men to regimental aid posts and casualty clearing stations. The following evening, the New Zealanders were relieved by the British 49th Division and they retired back into the Salient to await their generals' next move. From the perspective of the New Zealand Division, Broodseinde was a stunning victory. They had suffered 1853 casualties – one in four of the assaulting force, with 330 killed and 200 missing. They had advanced the line by nearly 2000 yards, taken over 1100 prisoners and killed a considerable number of the enemy – estimated at 800 in 1 Brigade's sector alone. Gravenstafel Spur, now in British hands, provided a good observation point for a further advance on Passchendaele Ridge.